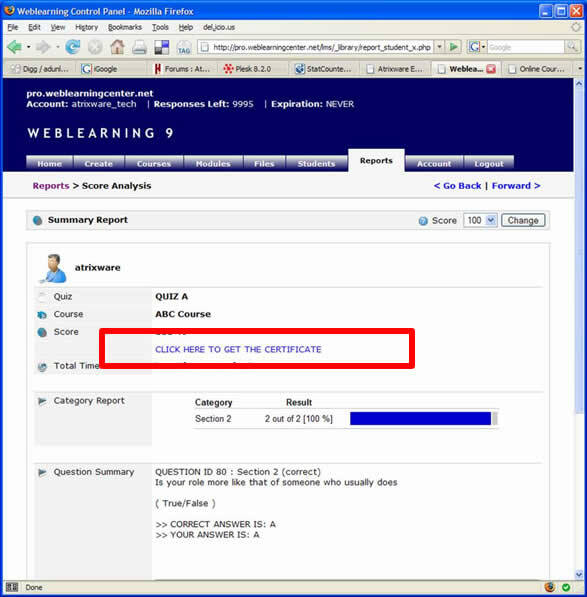 The Online Quiz Certificates functionality in Atrixware Weblearning 9 is a major improvement on previous versions in many ways. In this article, I will attempt to cover everything you need to know about them. Note that you can customize the certificate for each online quiz from the MODULES > PROPERTIES > ADVANCED SETTINGS tab. Each online quiz can have its own certificate content and layout (this is true for the BASIC, PRO and ENETRPRISE plans). 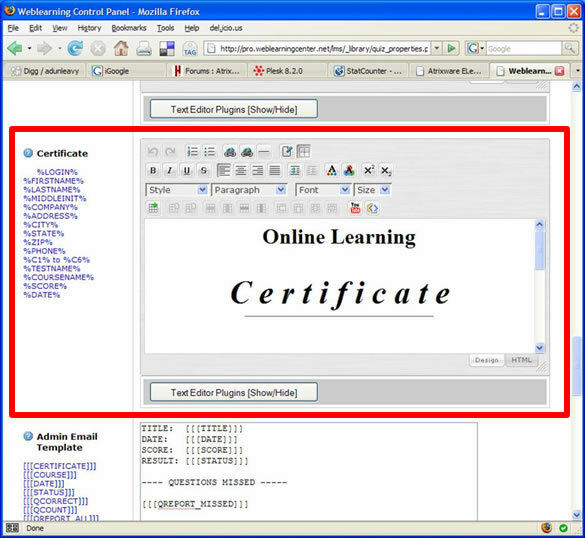 When a student completes an online quiz, a certificate is generated and is then stored in electronic format in to the database. There are various ways to ‘get to’ that certificate. There are ways you (as the administrator) can retrieve it, and also many ways the student can get to it. 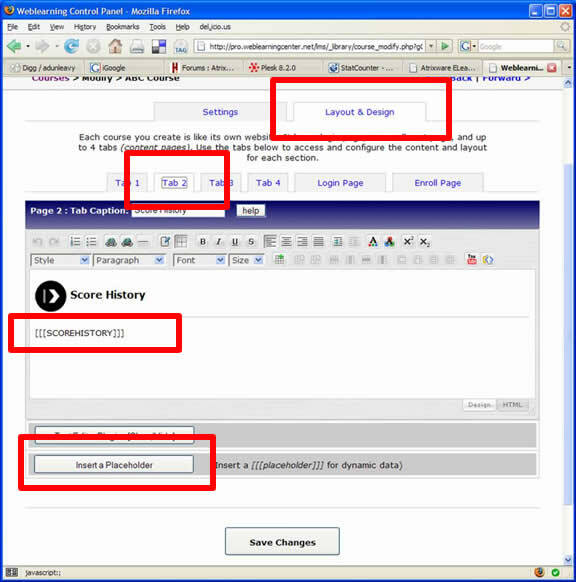 If you want to enable your students to access/print the certificate for the online quiz immediately after they pass, chances are your online quiz is already configured to allow that. To check, click MODULES > PROPERTIES > ADVANCED SETTINGS, scroll down to the PASS/COMPLETE RESPONSE setting, and make sure the placeholder [[[CERTIFICATE]]] appears somewhere in the content. 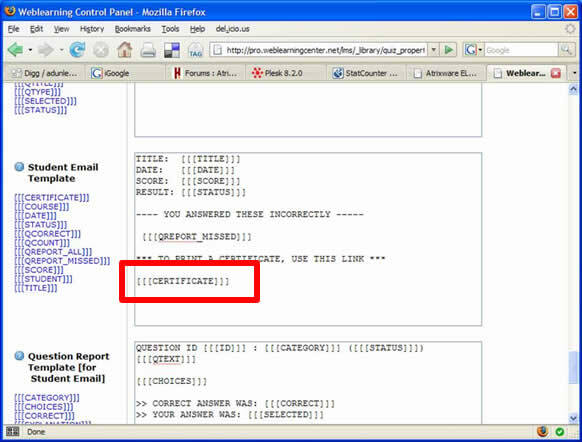 This will enable your students to print a certificate right from the response page when they complete the quiz. If you want to enable your students to access/print the online quiz certificate from an email, you can configure the student response for the online quiz to include a link to the certificate. To make sure your account has student emails enabled, click the ACCOUNT tab and make sure you have the “student email mode” setting configured to be “Yes Email Results..” (and click SUBMIT CHANGES). Next, click MODULES > PROPERTIES > ADVANCED SETTINGS, scroll down to the STUDENT EMAIL TEMPLATE setting, and make sure the placeholder [[[CERTIFICATE]]] appears somewhere in the content. 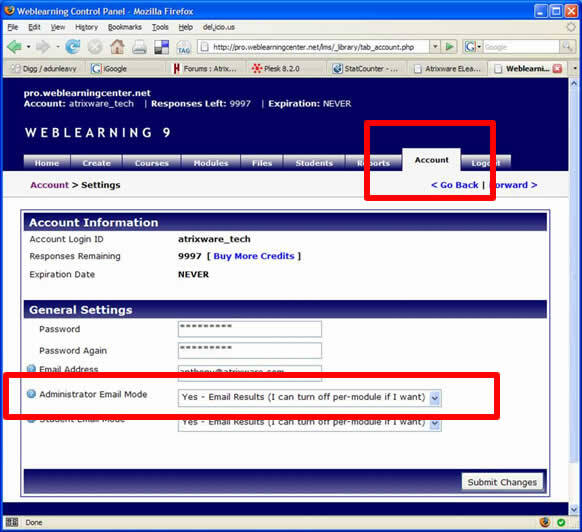 As long as the student has an email address in the system, an email will be sent to them. 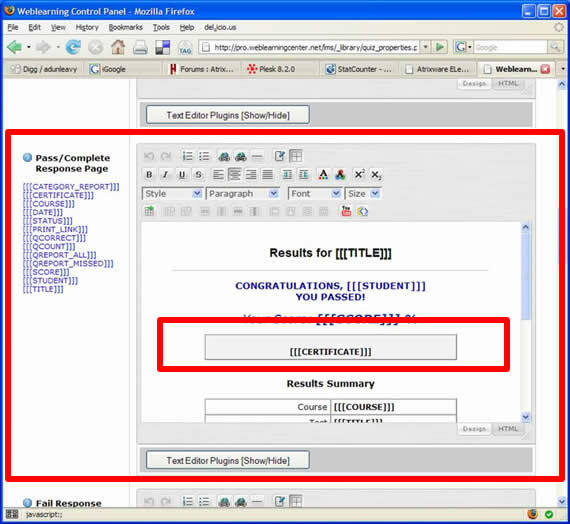 If you want to enable your students to access/print the certificate from inside the course login, you simply need to modify the score report to show a certificate link. 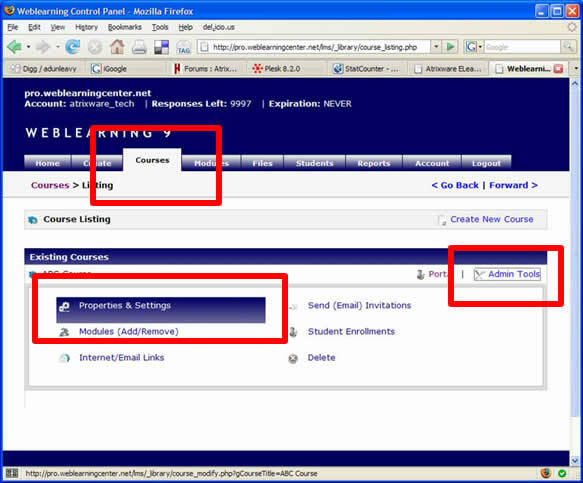 To do this, click the COURSES tab, then click ADMIN TOOLS next to the course that holds the online quiz, and then click PROPERTIES & SETTINGS. Delete the placeholder [[[SCOREHISTORY]]]. Next, click the INSERT A PLACEHOLDER button. When the placeholder popup window appears, click the “Insert Placeholder for All Other Dynamic Data” option, highlight “Placeholder for Extended Score History” from the list, and click INSERT >>. If you want the certificate link to be emailed to YOU each time an online quiz is complete, first click the ACCOUNT tab and make sure you have the “administrator email mode” setting configured to be “Yes Email Results..” (and click SUBMIT CHANGES). Next, click MODULES > PROPERTIES > ADVANCED SETTINGS, scroll down to the ADMIN EMAIL TEMPLATE setting, and make sure the placeholder [[[CERTIFICATE]]] appears somewhere in the content. 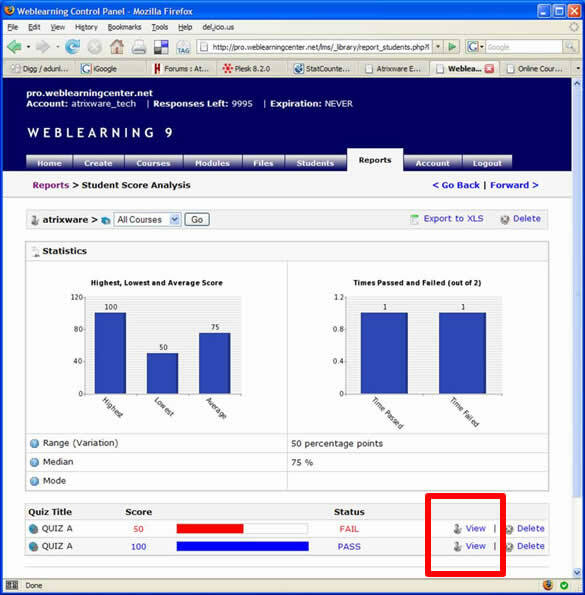 If you want to access the certificate from inside your Weblearning 9 account, you can access it from the REPORTS area in multiple ways. Here is one way. 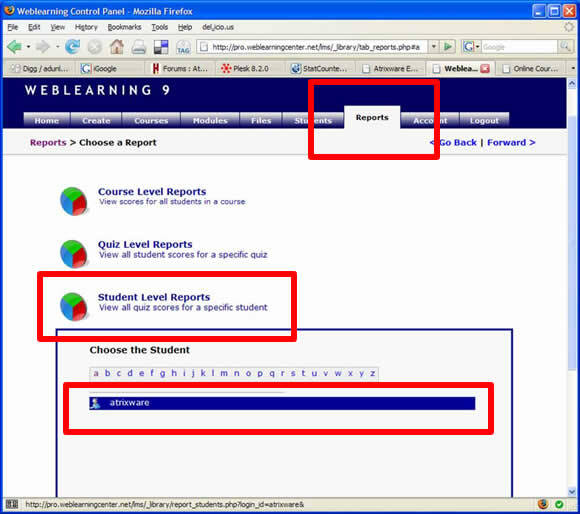 Click REPORTS > STUDENT LEVEL REPORTS and click on the student name. 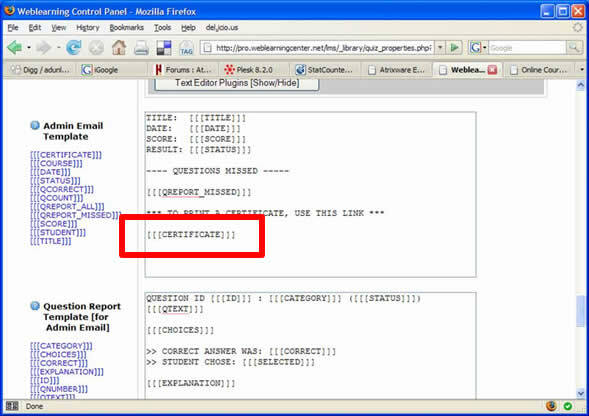 This entry was posted on Tuesday, February 19th, 2008 at 3:52 pm	and is filed under Anthony, Atrixware 101, Weblearning. Both comments and pings are currently closed.